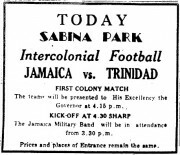 TRINIDAD WAS able to beat the Robin Hood team of Surinam only 2-nil last Sunday. While Robin Hood is a competent team, they were certainly not a match for Trinidad. Crisp, precise passing characterised their midfield play, and in that respect they looked better than Trinidad. But Trinidad looked better where it counts — in the goal area. The only trouble was that the Trinidad team did not exploit the innumerable opportunities that came its way. The will, it appeared, to consumate an attacking movement was just not there. The Trinidad forwards consistently got around defenders and then nothing. Our forwards were Cave, Brewster, David and Cummings. Cummings is one of our great players who has just returned from playing in the American professional league. He is a complete player and his special asset is a powerful shot. It was frustrating to see that asset underutilised. He was playing deep waiting for passes backwards so he could run on and shoot, but those passes seldom came. Steve David would hold on to the ball unnecessarily long, and lose it in the process. Brewster, who started at left wing and changed to the right for most of the game would make a brilliant run down the wing, evade his back and gently lob the ball to the goalkeeper. A faint cheer from the sparse crowd would encourage him in the futility. The other forward, Cave, is a trier. He is not a regular member of the national team as David and Brewster, so he tried to come good, but his game was lost somewhere in the effort. The forwards were supported by Douglas and Morgan in the half line, the latter showing some improvement. In his pre-Verity (the national coach) days he impressed as a fighting fit busybody who didn't take time off to think. In this match he made a concerted effort to control his exhuberance. In the defence Texeira was reasonable; Rondon and Murren were superb, but the left back Winston Phillip has no right on a national team. The flaws in his game are fundamental; on one occasion he shouted "Steve" intending to pass the ball to Steve David in centre field and the ball went bouncing out to Brewster on the left wing. It is a mystery why he is preferred to Henry Dennie and Chris Pierre, although their normal position is stopper, not wingback. The Oval ground was wet, yet firm, and ideal playing surface. Our footballers tend to play better on a damp/firm surface because they try to play too fast, and on dry true surfaces ball control looks like a Laurel and Hardy comedy routine. It is good to see that Verity has succeeded in cooling the tempo and the Oval surface was accommodating. If as I have suggested, Trinidad's performance was lethargic, that in no way reflects upon the competence of the coach or the TFA's efficiency. As a matter of fact, Trinidad looked more polished than ever in recent years, except Morgan. The TFA has given Verity more autonomy that it has ever given a coach before. But we can look at the team's performance against the background of the fact that six of the 26 invitees for national training refused to put country before club. Then we see a situation where national prestige is meaningless; people are reverting to primary loyalties. The lethargy in our national team's performance is only a reflection of that reversion.